This wall bracket is designed to hang most styles of guitar, which makes it ideal for display purposes, and to keep your guitar stored safely. This hanger features an attractive wood base for home mounting. Its autoswivel yoke allows for different shaped guitars and basses to hang vertically. 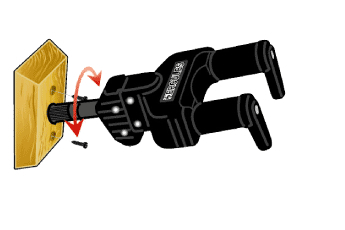 With this feature the yoke has an auto grab system which means that your instrument is held safely and securely. Specially formulated foam completely covers the yoke to protect the finish of your guitar. An excellent guitar hanger.